For Shaping Resistance (2015), Divecha collaborated with municipality gardeners in Sharjah to introduce a set of subtle vernacular disruptions into the otherwise regimented hedge design of the popular lagoonside Al Majaz Park, a temporary intervention that has since become a permanent feature. 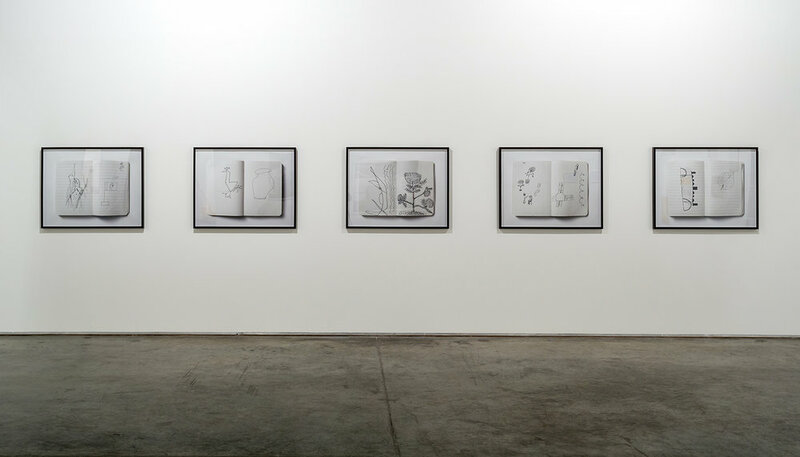 Grappling with complicated questions of authorship, appropriation, access and value, the Gardeners’ Sketchbooks (2017) series revisits key processual residue from Shaping Resistance—a set of sketchbooks used during drawing workshops Divecha conducted with his five collaborators, in which they experimented with and developed the alternative designs for the park’s hedges. Divecha leverages the visibility afforded to him through Minor Work to introduce these vernacular expressions, and their primary creators, into the commercial art context through a series of five photographs—each a neutral, almost clinical, image of a representative two-page spread selected by a gardener from his sketchbook. The gardeners will also decide, on how the proceeds from the sale of their respective works are to be distributed, restoring their stake—artistic and financial—in their work.